The Australian Shepherd (affectionately called an ‘Aussie’) does not actually originate in Australia. It is believed that some Basque farmers brought ancestors of these dogs with them when they emigrated to Australia, then subsequently to the United States during the 1849 California gold rush. However, the breed as it is known today was developed in the American Southwest over the next few decades. The Australian dog was crossed with several breeds in an effort to produce an animal able to deal with the harsh temperatures and demands of the American West. Breeding during this period was mainly focused on ability—speed, agility, and endurance--rather than appearance, which delayed the Australian Shepherd’s recognition as a breed. Australian Shepherds became popular pets after they were featured as rodeos performers in the 1950’s, and later in Disney films such as ‘Run Appaloosa Run’. The Miniature Australian Shepherd was created by selectively breeding small Australian Shepherds. It has increased in popularity in the last few years due to its combination of small size with high energy level and endurance. PLEASE NOTE: This breed has been accepted for recording in the AKC Foundation Stock Service (FSS). This is simply an avenue to maintain reputable records regarding the breed’s development. This breed is not eligible for AKC (American Kennel Club) registration. In addition, since May 2011, the AKC recognizes this breed as the Miniature American Shepherd. The Miniature Australian Shepherd has a shoulder height of 35-46 cm (13-18 in) and weighs 20-40 lbs. 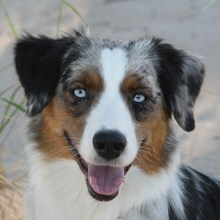 The Miniature Australian Shepherd has highly set, triangular ears, a moderately defined stop (point at which the muzzle meets the forehead), a scissors bite, and brown, blue, or amber eyes (or a combination thereof). It has a flat back, natural or docked bobtail, and oval feet. The Miniature Australian Shepherd is slightly longer than it is tall. The Miniature Australian Shepherd’s coat ranges from medium to long, with a dense undercoat. It can be straight or slightly wavy, and is highly weather resistant. The coat is short and soft on the head and legs, with a thick mane around the neck. The Miniature Australian Shepherd can be black, red, red merle (dark patches on a light colored background), or blue merle. All may have white markings or tan points. The Miniature Australian Shepherd is intelligent and eager to learn. It is relaxed, loyal, and devoted, bonding closely with family, even to the point of developing separation anxiety. Aussies are confident and lively; they are known to behave like puppies. The Miniature Australian Shepherd is intelligent and eager to learn. It is relaxed, loyal, and devoted, bonding closely with family, even to the point of developing separation anxiety. Aussies are confident and lively; they are known to behave like puppies. The Miniature Australian Shepherd is a great companion for children and other pets, especially if socialized as a puppy. It can be shy around strangers, as it is territorial by nature. Miniature Australian Shepherds are affectionate and kindhearted. They are easily bored. The Miniature Australian Shepherd can become nervous and destructive without frequent socialization and proper exercise. You can find Miniature Australian Shepherd puppies priced from $150 USD to $12500 USD with one of our credible breeders. Browse through our breeder's listings and find your perfect puppy at the perfect price. The Miniature Australian Shepherd is a great companion for children and other pets, especially if socialized as a puppy. It can be shy around strangers, as it is territorial by nature. Miniature Australian Shepherds are affectionate and kindhearted. They are easily bored. The Miniature Australian Shepherd can become nervous and destructive without frequent socialization and proper exercise. The Miniature Australian Shepherd requires relatively little grooming, but a thorough combing is required when shedding. Bathe only when necessary. Miniature Australian Shepherds can tolerate warm or cool climates, but must live indoors as they require constant socialization. Aussies have a life span of 12-13 years and litters of 5-8 puppies. The Miniature Australian Shepherd is fun to train because it learns quickly and easily. Aussies are unusually eager to please and adept at a wide variety of sports and games, such as herding, Flyball, and agility competitions. Not only does the Miniature Australian Shepherd need a lot of exercise, it needs to be kept occupied. The Miniature Australian Shepherd is an excellent companion for people that are active, particularly those who recreate outdoors. Miniature Australian Shepherds are especially popular in dog agility competitions and other dog sports. Aussies will do okay in an apartment if sufficiently exercised. Miniature Australian Shepherd Puppies for Sale - Shipped Worldwide! Finding the right Miniature Australian Shepherd puppy can be dog gone hard work. PuppyFind® provides a convenient and efficient means of selecting and purchasing the perfect Miniature Australian Shepherd puppy (or Miniature Australian Shepherd puppies) from the comfort of your home, 24 hours a day, 7 days a week. Take advantage of our PuppySearch or leisurely browse our directory of hundreds of dog breeds, Miniature Australian Shepherd dog breeders, Miniature Australian Shepherd dogs for adoption, and Miniature Australian Shepherd puppy for sale listings with photos and detailed descriptions. Some Miniature Australian Shepherd puppies for sale may be shipped Worldwide and include crate and veterinarian checkup. Many Miniature Australian Shepherd dog breeders with puppies for sale also offer a health guarantee. With thousands of Miniature Australian Shepherd puppies for sale and hundreds of Miniature Australian Shepherd dog breeders, you're sure to find the perfect Miniature Australian Shepherd puppy.